Birthplace : Missoula, Montana, U.S.
Jesse Tyler Ferguson is an American actor who portrays Mitchell Pritchett on the ABC sitcom Modern Family. Previously he played the role of Richie Velch in the CBS sitcom The Class. Ferguson was born in Missoula, Montana and moved to Albuquerque, New Mexico as a child. At age eight, he decided to become an actor and joined the Albuquerque Children's Theater where he was a member for six years. In high school, Ferguson played Albert Peterson in Bye Bye Birdie and General Bullmoose in Li'l Abner. He also joined his high school speech and debate team and worked as a dancer/singer at Cliff's Amusement Park. Ferguson mostly focused on acting for the stage, becoming a familiar face in Broadway and off-Broadway productions. His most notably role was as Leaf Coneybear in the acclaimed Broadway play The 25th Annual Putnam County Spelling Bee, for which he won a Drama Desk Award. While Ferguson began acting for film and television as early as 2000, he didn't score a regular TV gig until 2006, when he appeared on the short-lived CBS sitcom The Class. In 2008, he was part of the Fox comedy Do Not Disturb, which was cancelled after three episodes. The following year, he joined the cast of ABC's Modern Family, playing uptight lawyer Mitchell Pritchett: it earned him an Emmy nomination the following year. 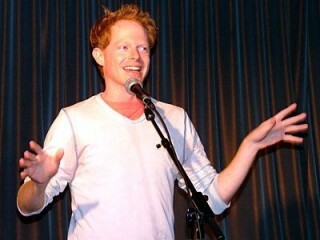 View the full website biography of Jesse Tyler Ferguson.